Caught on video Monday: Reporter Darren Hunt and photographer Ric Dupont of KVIA-TV in El Paso were handcuffed and taken to police headquarters for interviewing witnesses near the scene of a serious car wreck. In his handling of the matter, police Sgt. Raul Ramirez looks all too reminiscent of Dallas police officer Robert Powell in the nationally publicized Ryan Moats incident. Powell resigned from the force on the day after pleading for his job in a CBS11 interview. 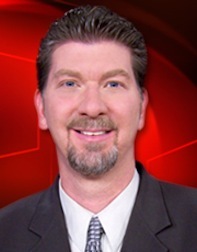 Hunt, who joined the ABC station in January 2006 after more than two decades as a sports reporter, was on the opposite end of the freeway on which the accident occurred. Ramirez can be seen climbing over a chain link fence to order him away from the scene. "We're doing our job," Hunt protests before heading toward the KVIA vehicle. With his back to Ramirez, Hunt then says, "He can shoot if he wants to," referring to his photographer. This prompts an incensed Ramirez to run after Hunt and eventually handcuff him after the reporter says, "It's fine. I'll go." "You're not going," Ramirez tells him. "I'm not resisting," the reporter protests. His KVIA microphone is clearly visible on the vehicle's car hood. A handcuffed Hunt later is pushed against the chain link fence by Ramirez, who has been assigned to desk duty while the El Paso police department investigates the matter. Police spokesman Javier Sambrano told the station on camera: "It's unfortunate at any time that any member of the public or the news media feels that they were treated unfairly by any member of our department. And so that's a very serious type of allegation -- something that we definitely have to ensure that we investigate completely. And that's the reason that we are here and conducting an investigation." Hunt and Dupont were released shortly after being taken to the Westside Regional Command Center, KVIA says. Here's the video. It's quite arresting, so to speak.